Welcome to Palous﻿e River Quilts! Our shop began as a casual conversation in the car ("Wouldn't it be fun if we opened a quilt store?") in July of 2012 to opening in March 2013. It has been so much fun to create a place for quilters and needle artists to shop and be inspired. Our goal is to give you, our customer, the best service possible and to be sure all of your quilting and needle arts supplies are readily available. We look forward to welcoming you to our shop! Palouse River Quilts shop is located in Colfax, Washington, in the heart of the Palouse (pah loose'). 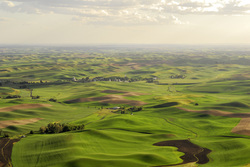 The Palouse is a region of gently rolling hills in Eastern Washington formed in the ice ages when soil blew in from surrounding glacial plains. The fertile soil allows some of the most productive dry-land grain farming in the world. The hills constantly change color and texture with the changing seasons and farmers' plowing, harvesting, and tilling. Added to that are spectacular sunrises and sunsets making a region that is a constant inspiration to artists of all kinds. Our thanks to Dan Griffis, Columbia Bank, for this beautiful photograph taken from the top of Steptoe Butte.